Today you will learn how to create a successful content piece. All of this is going to be helpful if you’re creating content (on your blog, YouTube, Instagram, Facebook or Twitter). I’ll share with you a formula and show you how to get the customer moving from one step to the next successfully. If you’re struggling to create content pieces here’s a little step by step process that you can use to generate and create more content. You’ll make a more significant connection with your audience. Keep in mind that in between you do have things that could be bridged. 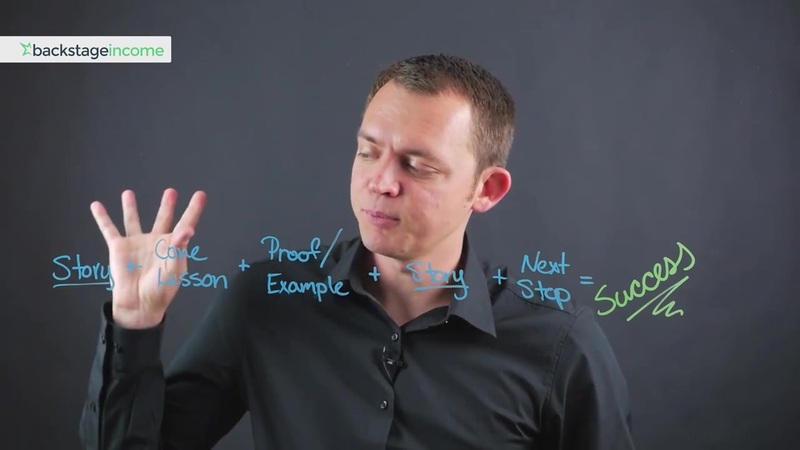 You have to create bridges to build the smooth transition from a proof (an example) to the story. Besides that, you could swap some of these. If you want to swap the proof and the core lesson you could also do that as well. At some point, you could eliminate some of these if you have a how-to article and you don’t want a proof (an example). That way, you could eliminate this. Maybe a scenario could be that you have a top 10 list you might not even need a story at all. With that in mind, I want to share with you an example of how this works in a real-world application. Let’s say you’re creating a content piece and this content piece is about starting an online business – filming videos. Suppose you’re filming with limited cash, so you don’t have a lot of money. What you can do is if you’re trying to create this article piece; How to start a YouTube business with less than $50, you can do the following. and that creates your success. You could put the story and core lesson together. Let’s say you were filming your dog and you can show the way of how you’ve done it personally. You’re filming your dog with a smartphone, and you realize that you don’t need a fancy camera. 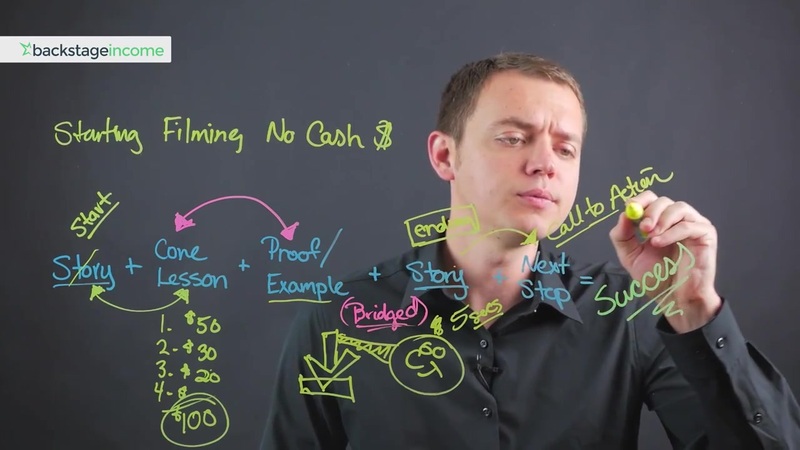 You can make a great video without spending an enormous amount of money like other YouTubers. Show your audience that you’ve realized that you could start your YouTube business for cheap. Share with them that you started just by using natural lighting, without backdrop and super-fancy lighting. Tell them your story. Then you could get into the core lesson or the proof. You could say: This is how I did it, here’s my evidence, and show your viewers what you have. After that, you could say: Here’s how you could do it. You don’t need expensive equipment. Here’re the steps for you to take. But if you do want to buy things – here are all the things that you need. And then list every single thing that they might need (lights, mic, backdrop). And tell them that they can create a studio for less than $100. That could be your proof. You need to bridge everything back. You can say this is how I’ve done it, I’ve been filming my dog not too long ago, and now I have an online business. This way, you’re tying it in towards the end with the story. You can also give away a quick little clip of your dog, so that way you could link it back to the story. Because this was their starting point and you want to connect it with the ending point. That short video can make a difference between a compelling message and a bad one. And then you let them know their next step – what to do next. In other words – Call to Action. How to Set The Final Punch? Depending on the article that you’re doing you can make your decision. You can swap some things, make adjustments. Whatever works for you. The main thing is that you start with the story, then you say this is how you can do it as well. After that show the proof and then you tie it back to that story on the beginning. In the end, tell your readers or viewers the next step – the call to action. Whatever you want them to do next. Maybe it’s signing up to the newsletter, perhaps something else. 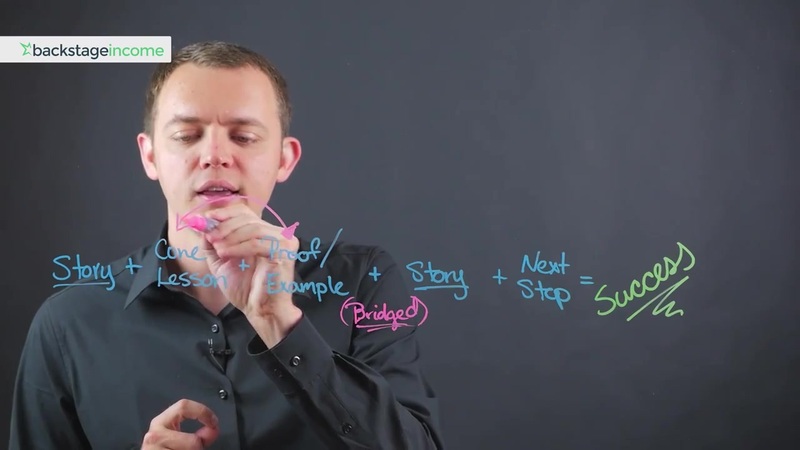 This is your formula for creating content that works. Because you’re tying all of these things back. You got your lesson, you got your proof, you got your example, and it gives them a feeling of connection to the story. As I said earlier, you don’t always have to have a story because, for example, top 10 lists may not need it at all. Next, short content forms may not have a story and then you need to leave out a few of these. But overall, if you have this kind of flow and process, it allows the human mind to go from one thought to the next in a nice flow. Having consistency, a procedure, and a step-by-step process, it’s all about. That’s where advance sales letters go with, and you want to follow that process.